Songs of Eretz Poetry Review is pleased to present “Herman, The Sturgeon” by Tricia Knoll, a Songs of Eretz Frequent Contributor and this week’s Poet of the Week. A biography of the poet may be found in the “About Our Editor & Frequent Contributors” section. next to three young girls with ponytails. Herman glides, a profile of fossils. Residence: Bonneville Fish Hatchery on the Columbia River –– since 1998 captive in a man-made pool fed by Tanner Creek and groundwater. One Herman or another has circled this pool for over sixty years. The blonde mother distracts her kids with goldfish crackers. Does Herman see my hands splayed on the glass? heading through Bonneville’s locks to Lewiston? Does his brain sense how near his river is? How high the wall to the upper Columbia? of his wild identity, this land-locked fish. Does he always swim clockwise? His eyes give away nothing. armored scutes. Yet – a brain that integrates. through my hands, through the glass. Does he feel how my laying-on pulses the water? Poet’s Notes: I believe the Columbia River Gorge is one of the wonders of the world. I lament the loss of Celilo Falls and centuries of petroglyphs under Bonneville Dam. Other losses include robust fish migrations. 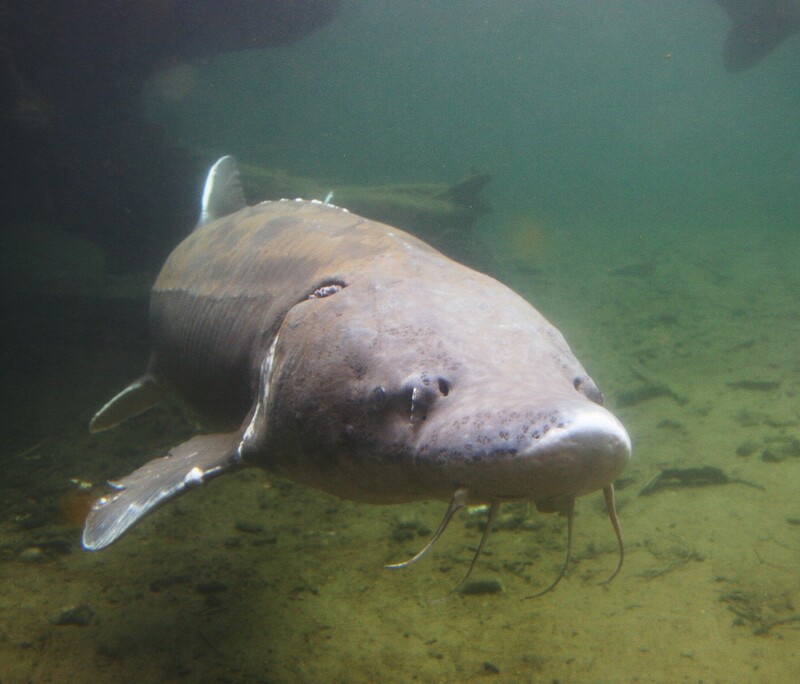 Herman is a real fish (pictured), a humongous fish, incarcerated for his lifetime in a small pond at a hatchery as a tourist attraction.